On the 14th of September the ruggers from the FSV Trier-Tarforst had their first game of the seasons after their advancement to the third division (West). Against the second fifteen of the SC Frankfurt 1880 it was the order of the day to put the pre-seaon training into action. On the rain-soaked pitch it became rather quickly apparent that the numerous new players still lacked the necessary experience in some deciding moments. Although the Trier defence, under the leadership of captain Elliot Curtis, stood strong against the enemy attacks and only permitted two tries, various mistakes and inattentions allowed Frankfurt to gain the game-winning points by converting three free kicks. On top of that the Trier ruggers were handicapped by two yellow cards and an early injury of flanker Konstantin Droin. 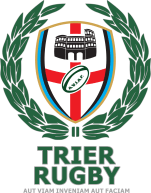 Consequently, despite putting up a tough fight, Trier could not catch up with Frankfurt, who won the game narrowly with 23 to 12 (half-time: 13:5). An impressive performance was shown by the new Trier fullback, Joshua Whalen. His secure catching skills not only defused numerous dangerous kicks by the home team, but he also presented two impressive runs, the first of which he topped off with the first try for Trier. Furthermore he prepared the second try by Holger Steinmetzger. Until the upcoming match on the 5th of October there remains enough time for the two trainers, Klormann and Dewald, to work at the displayed weaknesses.